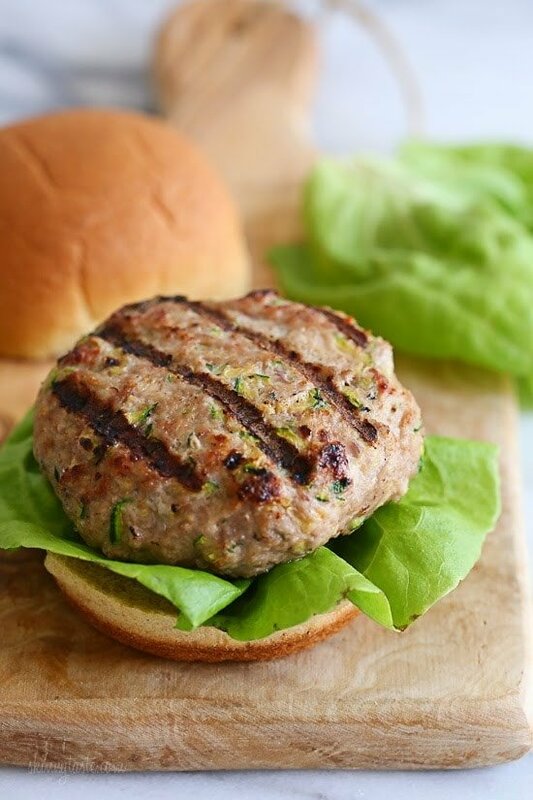 These are the BEST turkey burgers! They come out so juicy, and the flavor is delicious. 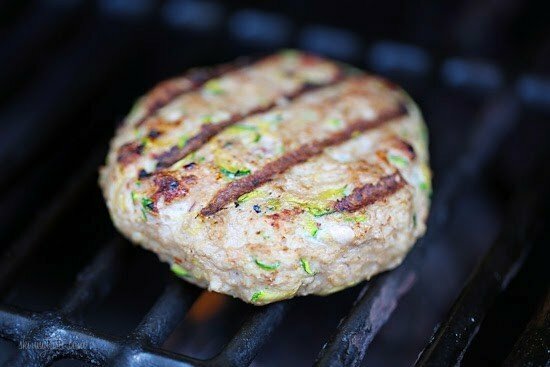 I started experimenting with adding zucchini to my turkey burgers back in 2010 and never looked back. 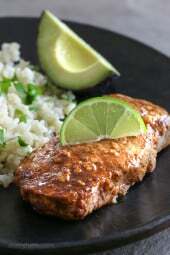 They are healthy, easy and and perfect for quick dinners any night of the week. You can also try these Greek Feta Turkey Burgers. Adding zucchini also lowers the calories per serving because you get five patties out of 1 pound of ground turkey them instead of four. 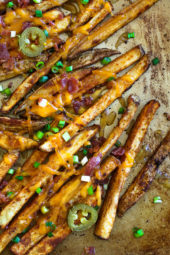 Serve them with your favorite burger toppings, on a whole wheat bun or skip the bun and serve them on lettuce to keep the carbs low. These can be grilled or cooked indoors. If you want to make them on the grill, it’s best to make the patties ahead (overnight is best) and keep them refrigerated so they hold their shape. You can also freeze them and thaw them right on the grill. Use a box grater to grate the zucchini, onion and garlic super fine. A mini chopper would also work. Get the pan hot before you put the burgers on to get a nice sear, then lowered the flame to the lowest setting to let the burgers cook all the way through, turning a few times so the burgers don’t burn. Squeeze ALL the moisture from the zucchini with paper towels. In a large bowl, combine ground turkey, zucchini, breadcrumbs, garlic, onion, salt and pepper. Make 5 equal patties, 4 1/2 ounces each, not too thick so they cook in the center. Heat a large nonstick skillet on high heat. When hot, lightly spray oil. Add burgers to the pan and reduce the heat to low. Cook on one side until browned, then flip. Flip over a few times to prevent burning and to make sure the burgers are cooked all the way through. Cook in a single layer in two batches 370F for 10 minutes, turning half way until browned and cooked through in the center. Clean grill well before cooking and spray with oil spray to prevent sticking. Cook the burgers on medium heat about 5 minutes on each side, or until no longer pink in the center. My trick to making the juiciest turkey burgers EVER is by adding grated zucchini! A huge bonus if you want your kids to eat more veggies – they’ll never know! Squeeze ALL the moisture from the zucchini with paper towels. In a large bowl, combine ground turkey, zucchini, breadcrumbs, garlic, onion, salt and pepper. Make 5 equal patties, 4 ounces each, not too thick so they cook in the center. STOVE: Heat a large nonstick skillet on high heat. When hot, lightly spray oil. Add burgers to the pan and reduce the heat to low. Cook on one side until browned, then flip. Flip over a few times to prevent burning and to make sure the burgers are cooked all the way through. If grilling: Clean grill well before cooking and spray with oil spray to prevent sticking. Cook the burgers on medium heat about 5 minutes on each side, or until no longer pink in the center. Squeeze out all the moisture well from the zucchini using paper towels. In a large bowl, combine the ground turkey, zucchini, breadcrumbs, garlic, onion, salt and pepper. Make 5 equal patties, 4 ounces each, 1/2 inch thick. Cook in a single layer in two batches 10 minutes, turning half way until browned and cooked through in the center. 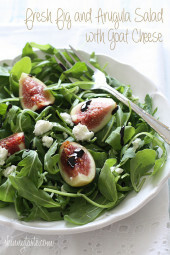 *Use gluten-free crumbs for gluten-free diets. 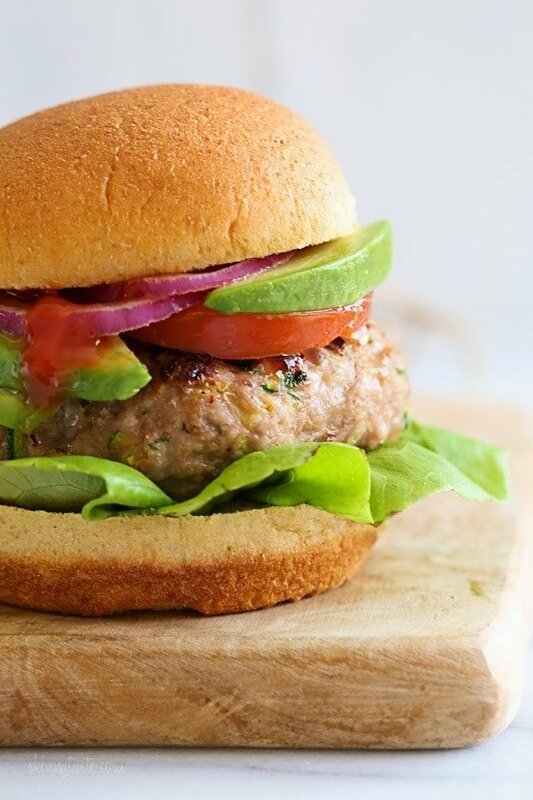 This will be my go-to turkey burger recipe! So juicy and delicious! I used to use BBQ sauce to make them moist, but the zucchini does it without sugar and with added veggie benefit. Thanks for sharing this! I cooked them in a grill pan on the stove. Great tasting burger! I cooked them on the stovetop as described but used olive oil instead of cooking spray and they crumbled up. Does the cooking spray make a difference? Thanks!